How it’s New York: Visit to a New York bar. How it’s Irish: It’s an Irish bar named for an Oscar Wilde character. I had heard about the award-winning Guinness, the excellence of the Sunday brunch, and the welcome on the mat, but this was a windy Wednesday weekday at two in the afternoon and the door was closed. As my companion and I had just walked for an hour to get there I decided that a little judicious Dorian door-rattling was justified, and, with the luck of the Irish, we managed to scare up the barman from the inky interior just as he was “about to open up” anyway. The barman turned out be Jesse, an affable budding musician from Oregon, newly minted in the big Apple, who informed us the chef doesn’t start until four o’clock. No matter, we said. Then we’ll just have a drink. After only a little thoughtful perusal of the bar, and for sadly predictable reasons, I desperately wanted to order a pitcher of Dorian Gray. I was rather pleased with this idea, not only because a pitcher of Dorian Gray would be the perfect addition to the beer menu, but also because it would epitomize that elusive locution: a pun that never gets old. However, as we still had Lillie’s (named for Lillie Langtry) and the new Oscar Wilde Bar ahead of us, I did not not want our literary pub crawl to become literally a pub crawl, so I ordered a pint of the Amber instead, obviously influenced subliminally by the color of the Dor-mat. 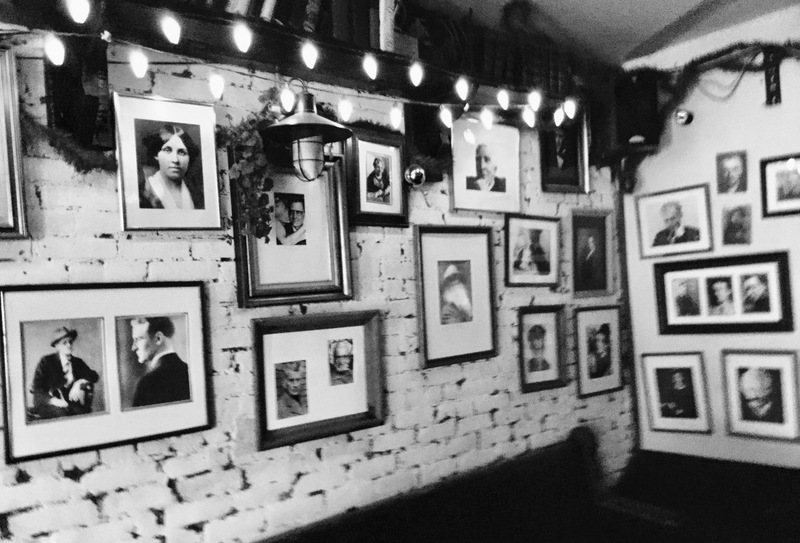 It was then that the tradition of ye olde pub challenge came up, the ritual being that anyone who can name 15 of the assorted literary faces who adorn the exposed brick walls gets a free drink. I don’t know what the record is but the regular clientele, presumably comp-sci undergrads from nearby NYU, often fall short. Locals discount the anomalous 43 scored by an English-Lit professor as an unlawful act with knowledge aforethought. I, being somewhere betwixt, thought I could get 15. I cinched the canonical: Joyce, Twain, Whitman, even Shakespeare (pah! ); coped with the challenge of Longfellow, Alcott, Dickinson and the like; and then after circling the saloon several times finally clinched the quaff with Samuel Beckett. 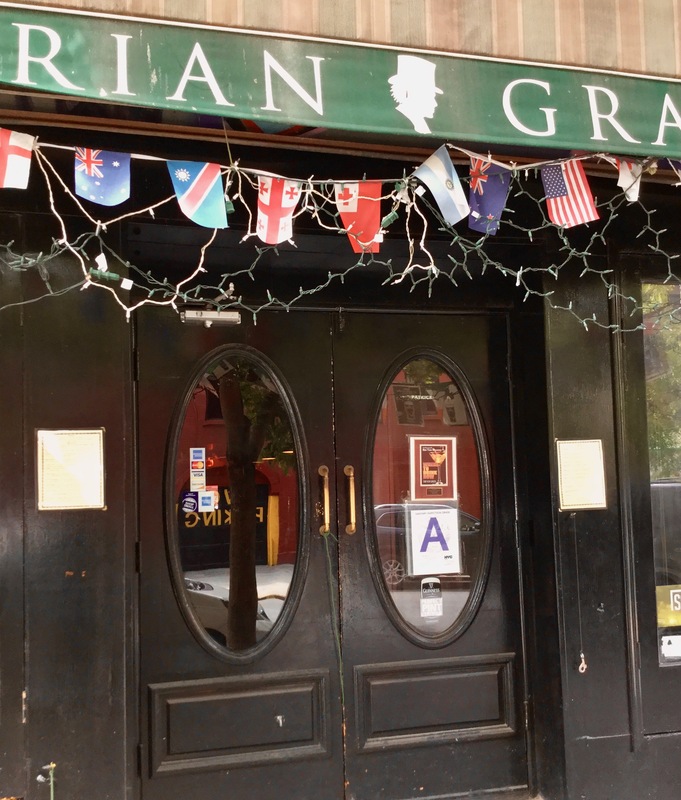 The amber nectar tasted all the better for the achievement, and we moved on to waterholes uptown (and that’s another story) but not before deciding to make Dorian Gray, and its ghosts of literature past, a regular haunt.